Rory McIlroy takes a drop on the 18th during the second round of the Dubai World ChampionshipRoll up, roll up as the amazing Rory McIlroy attempts his most difficult feat yet - winning the Dubai World Championship with a suspected case of dengue fever while coming from five strokes behind the longest hitter in the world. That’s the scenario facing world No 2 Rory McIlroy, who must also hope that his rival of the European Money title finishes outside the top nine. Luke Donald is up to tied 12th, however, after turning a very average round into an excellent 68 by finishing with three consecutive birdies to finish. As if to make life even more difficult, McIlroy finished with pair of bogeys for a 71 that left him on seven under. Quiros fired a 64 to lead by four from Peter Hanson with McIlroy tied for third with the ever improving Robert Rock. Even Shane Lowry got in on the act, chipping in for eagle at the last for a 70 to move up to tied seventh on five under. 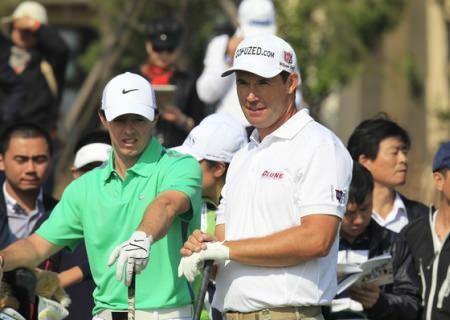 McIlroy is not a man to be intimidated but there was a hint of trepidation as he contemplated the two rounds ahead. He needs to win on Sunday to give himself any chance of topping the European Tour’s money list for the first time in his career. Even then he will need Donald to finish no higher than 10th. After 36 holes Donald was in 12th place. Quirós, though, appeared to have no inclination of relinquishing his advantage, pointing out that there were other plot-lines simmering here besides McIlroy’s tussle with Donald to win the Race to Dubai. Short game woes and mental errors dented Rory McIlroy and Shane Lowry's DP World Tour Championship chances as Rafa Cabrera Bello produced a Seve-like performance to grab a share the lead at Jumeriah Golf Estates. Rory McIlroy looked certain to go five clear of the field when he went for the 18th in two in the third round of the Omega Dubai Desert Classic. But after finding water short of the green his up and down to save a par five and remain four ahead of the chasing pack felt almost as good. 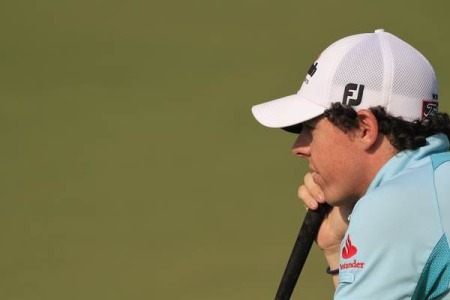 It also said a lot about McIlroy's ability to churn out a score. Even when he’s bad he’s good, though Saturday, Rory McIlroy was as almost good as ever as he shot a best-of-the-day seven under par 65 in the third round of the DP World Tour Championship, Dubai to put himself on the brink of a glorious double on Sunday. Rory McIlroy threw down the gauntlet to Luke Donald in the first round of the Dubai World Championship. Picture Fran Caffrey www.golffile.ieThe US PGA Championship was a watershed for Rory McIlroy. Okay, the US Open was a true game changer given the way the 22-year old Ulsterman recovered from his back nine “meltdown” at Augusta National in the Masters to win his first major title by the obscene margin of eight strokes. But since he jarred his wrist at Atlanta Athletic Club and went public with his relationship with world tennis No 1 Caroline Wozniacki, the pride of Hollywood has arguably been the best player in the world.